After your offer on that perfect home is accepted by the seller, it's time to schedule a home inspection. Your agent may have already advised that though it may be the perfect home for you, there may be hidden things you did not notice. This is your window of opportunity to learn from a licensed inspector what repairs may be needed before you complete the purchase. Typically, your purchase and sales contract will state that you have the right to a home inspection under its terms and conditions, and the buyer usually must complete the inspection within a given number of days of the seller's acceptance. An inspection may be done with new construction, but builders offering new homes for sale usually give buyers a guarantee on the home and its condition. This is probably the only case in which a buyer can forgo an inspection with some peace of mind. But in most cases, your agent will tell you that an inspection is a must-do for all home purchases. 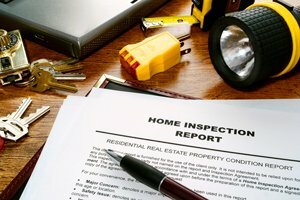 Why should I get a home inspection, and what will it cost? A home inspection is insurance that you are getting the house you think you are, and if not, it offers the buyer the right to renegotiate the sales price previously agreed upon with the seller should any major repair need be discovered. In other words, if you learn this dream house needs a new roof, you can go back to the seller to negotiate a credit toward the cost of that repair. The seller can refuse, but then the buyer typically has the option of walking away from the deal with their earnest money returned. The inspection typically takes around 3–4 hours and can cost approximately $350 or more. You only undergo this expense after you are under contract, assuring that nobody else can step in and buy the house while you are performing due diligence. What will be checked during the inspection? Big on the list is a thorough inspection of the roof, doors, and all the windows. Decks and walkways, as well as the driveway, should be on the report too. Also on the list are reviews of the home's foundation, framing, plumbing, heating and cooling systems, and all electrical systems. Big issues that could indicate a repair problem include signs of water damage, mold, pest issues or damage, and even asbestos in materials used in the home. How do you choose a home inspector? When searching for a professional you can trust, it is best to ask for referrals from friends and neighbors, and you can even check out the list at your local better business bureau. Your real estate agent may also have a list of inspectors in the area they have heard good things about, so ask if they have some names to share. When you think you have found one, ask what professional groups the inspector belongs to and what kind of training he or she has had. Ask about a guarantee if the inspector should miss anything. You should also be allowed to attend the inspection. What does the inspection report mean? The inspector you hire is working for you to give a professional opinion about current or potential issues with the property. If something is found to be wrong with the home structurally or with any of the home's systems, they may point out that repair or replacement is needed and then advise you to get a contractor to give you a more detailed idea of timing and estimated cost of repairs. If this is an older home for sale, the list may be longer than you thought, depending on what maintenance and replacements the seller has done over the years. If your inspector is thorough, the report may seem daunting. Remember, this is not supposed to be done to worry or scare you about buying a home. Look at the information you get as just a comprehensive report that makes sense to you and allows you to make an informed decision. A good inspector explains the difference between repairs he sees as "needed in the next five years" as opposed to "imminent problems" with the home. The report should tell you what needs to be fixed, when (a time frame in months or years) you would probably have to do it, and approximately how much it will cost. A home inspection gives you a fuller picture of the home you are buying, which can save you time and money down the road, and give you peace of mind about what you are purchasing. It is the foundation to making a smart purchase, so make sure you check this important step off your home buying checklist.